Welcome to the Christmas in July Blog Tour! 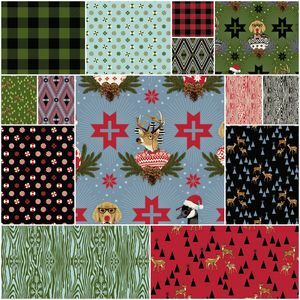 I was really excited last December when I read the Confessions of a Fabric Addict Blog, and Sarah had put out a request for interest in participating in a Christmas in July Blog Hop. I immediately jumped on board and asked to participate. After searching our house top to bottom several times for the one microwave bowl cozy we have and not finding it, I decided to make some. 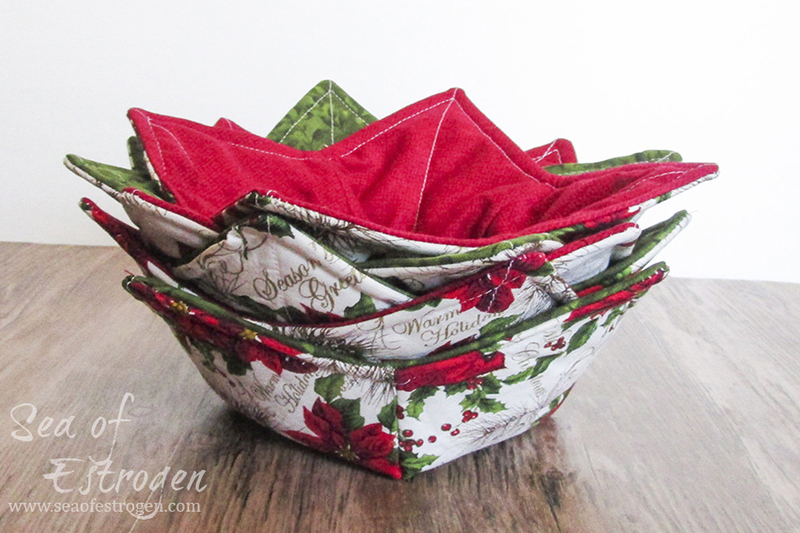 I received the Christmas fabric as a gift from a friend, and I decided it would make really pretty bowl cozies paired with semi-solid fabrics as the lining. Be sure to read clear to the end to learn about an amazing give-away! 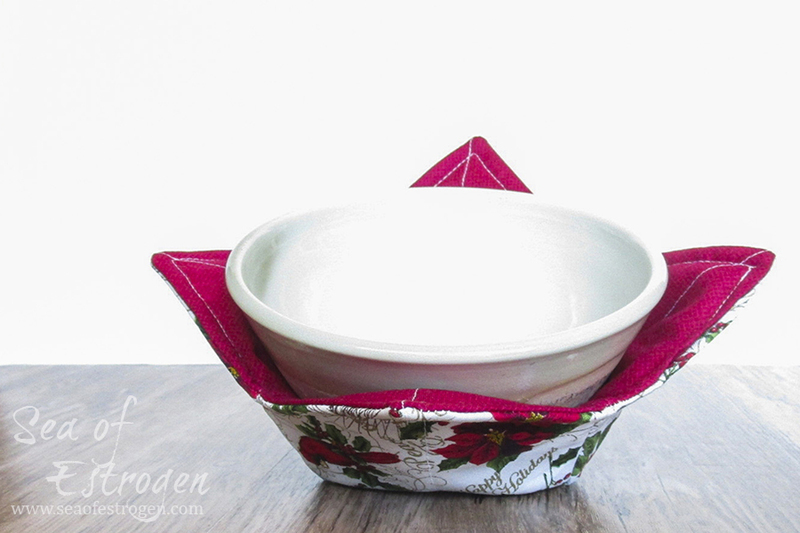 If you are not familiar with microwave bowl cozies, they are basically bowl-shaped pot-holders. They are used when microwaving a bowl so that the hot bowl doesn’t burn fingers when you remove it from the microwave. In addition, they can be used to insulate hands against cold bowls – ice cream, anyone? 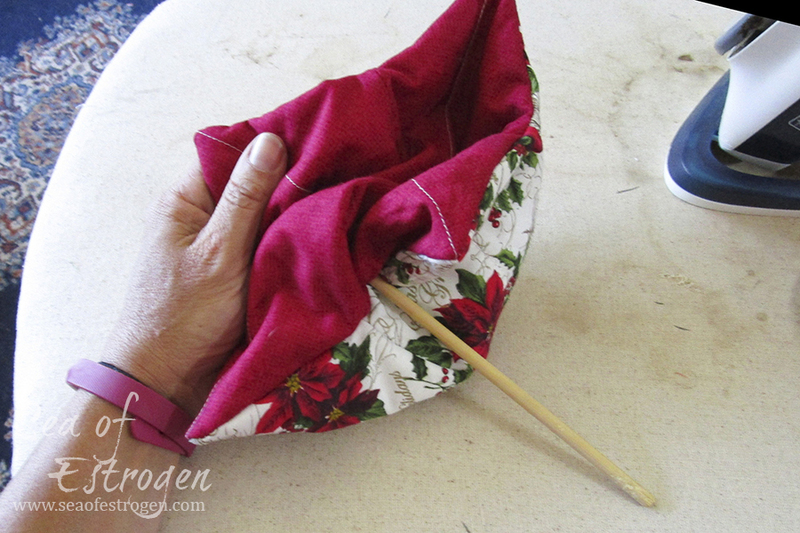 The assembly of the bowl cozies is pretty simple, and the most difficult step is adding the side darts. The darts themselves aren’t difficult, rather, they are time consuming. For example, I made six bowl cozies. Each of the two pieces of the bowl cozy has four darts, so eight darts per cozy, which equals 48 darts. You want to make sure you use 100% cotton materials because synthetic fibers could melt or catch fire in the microwave. 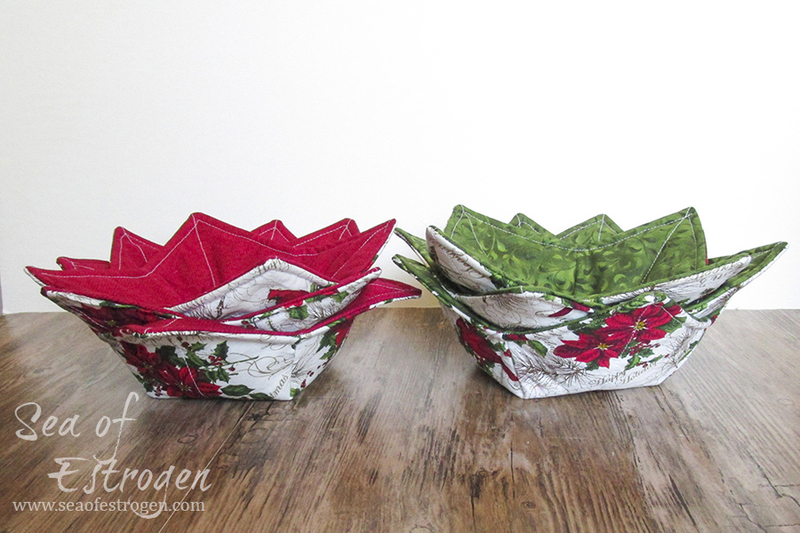 For each bowl cozy you plan on making you will need two 10″ squares of batting and one 10″ square of each fabric being used (two total fabric squares). 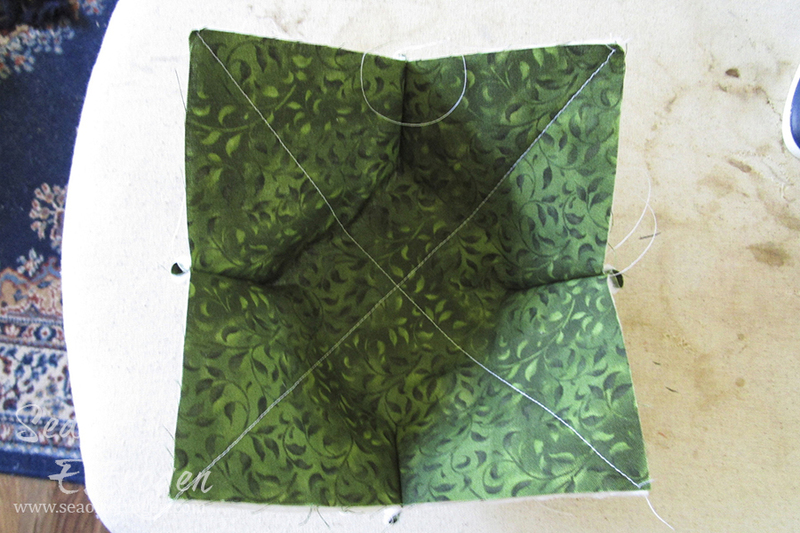 To begin, match a piece of batting to each piece of fabric, and sew an “X” from corner to corner. Next, mark the darts. My darts are centered on each side of the square. They are 2″ on the flat side, and extend 2-1/4″ towards the center. Since I had so many darts to mark, I made a template out of a thin piece of cardboard and used it to mark all the darts. 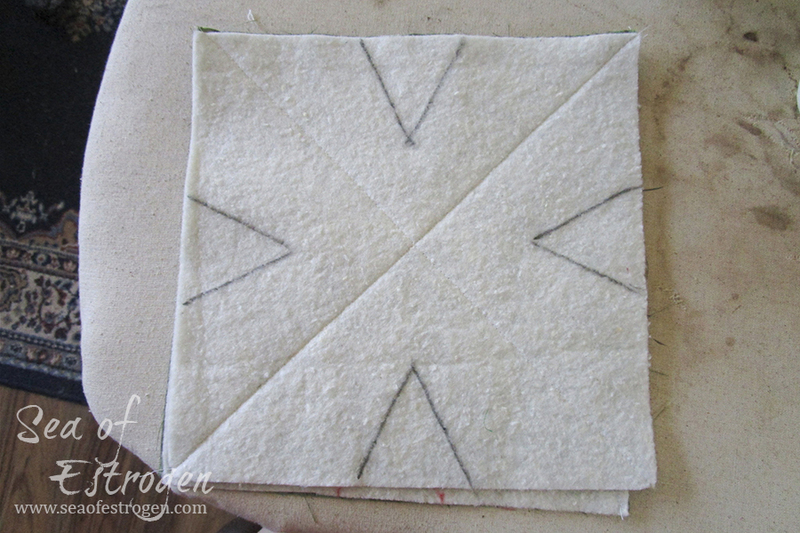 Fold the edges, matching the dart lines, and stitch. 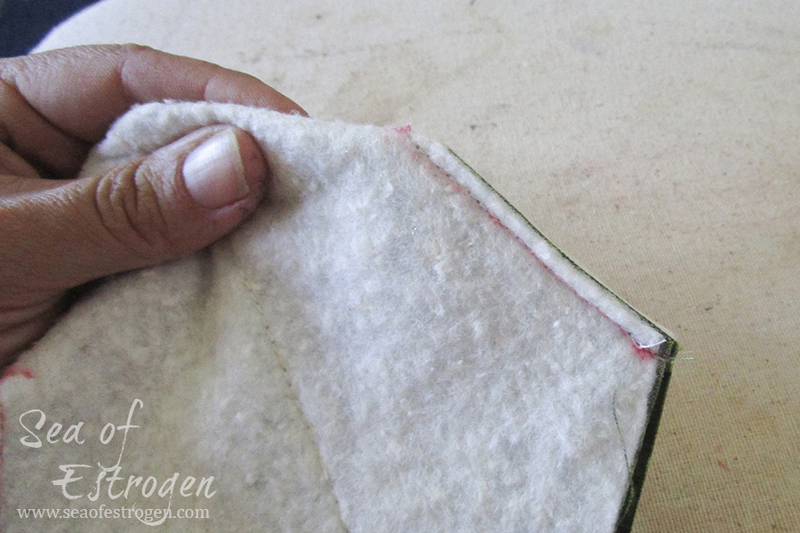 Once all darts are stitched, trim seams and clip threads. At this point, each piece should resemble a squared-off bowl shape. Next, match a lining piece with an external piece, and pin, right sides together, matching corners and darts. 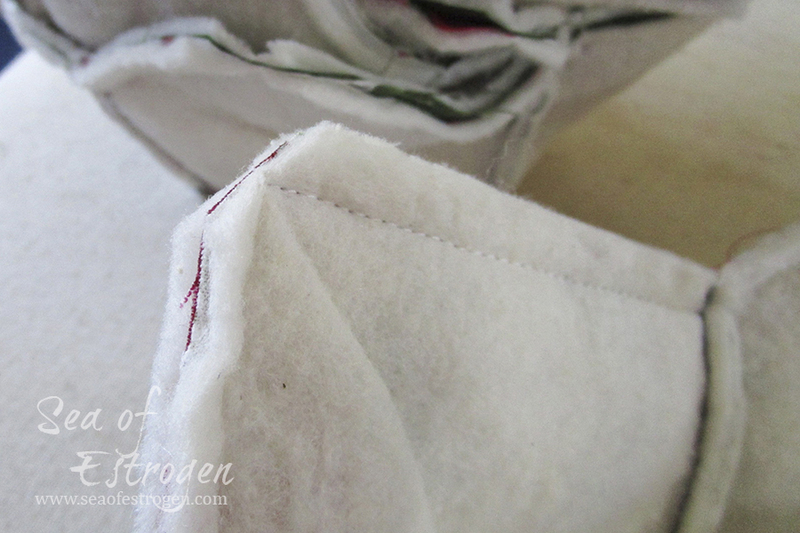 Stitch together around the edge using a 1/4″ seam allowance and leaving an opening for turning right side out. I mark the opening with double pins on each end of the opening. Turn the bowl cozy right side out through the opening, use a chopstick or other tool to push out corners. Press and topstitch around the edge, closing the opening used for turning. Your bowl cozies are now finished, and it is time to enjoy some warm soup, or, since it is July, some chilly ice cream! Feel free to ask any questions in the comments below, and I will try to answer them as quickly as possible. This fun project and blog tour is the second completed project on my 2017 Quarter Three Finish-A-Long List! And as if great holiday ideas and a tutorial weren’t enough, this year we’ve got something extra special! The lovely folks over at Free Spirit Fabrics have donated not just one item for a giveaway, but THIRTEEN! And it’s pretty drool-worthy stuff, too – it’s Tula Pink’s new holiday line, Holiday Homies!!! Sarah has six design rolls, six layer cakes, and one fat quarter bundle to give away – and here’s how she’s going to do it! Visit each stop on the hop, including this blog, and leave a comment on each post for the day. At the end of the hop, Sarah will do a giveaway for each day by putting everyone’s name in the hat who commented that day (from all that day’s hop-blogs), and drawing a winner for that day. That will be twelve winners – the design rolls and layer cakes. At the very end, Sarah will put all the names from all the days in a hat and draw out a grand prize winner for the fat quarter bundle! Only one prize per person, though – let’s spread it around a bit! So carve out a bit of time to visit all the blogs and comment. I have made bowl cozies, but I like your method better than the one I used. I will have to try it out. Thanks! Thanks for the tutorial, we could use a few of these in our home!!! 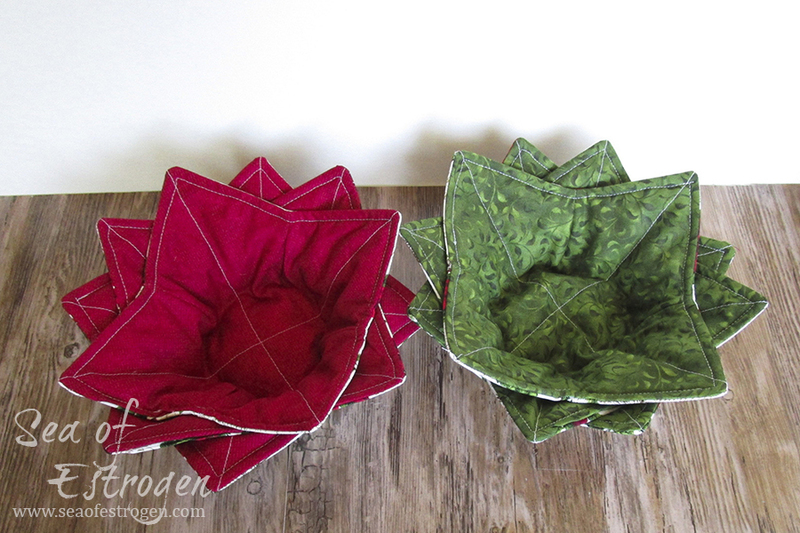 Beautiful bowl cozies, thank for the tutorial. Doing this hop is so much fun isn’t it!! I had a request to make some for our parish fair in July! Thanks for the instructions – a great tutorial. I love these bowls. I have made a few in the past as gifts but can’t seem to find my directions. So glad to see them here. Thanks. Love them in the Christmas fabrics too. How pretty, I have to make some of these, ice cream is my favourite and the bowl does get very cold. Thank you for the tutorial. These microwave bowl holders do come in handy. Thanks for the tutorial. I can’t wait to make some of these for gifts. I keep seeing these and thinking I should make some. Do you need the dimensions for your bowls, or do the holders seem to be a standard size? My bowls have a wider base than the ones you’ve shown. Thanks! 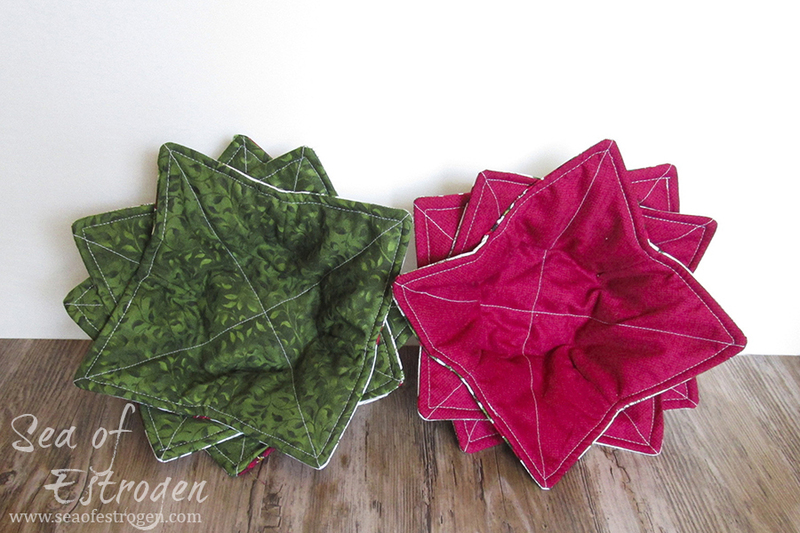 I made these using 10″ squares of fabric and batting. They work well with all the different bowl sizes we have. We have a lot of custom-made ceramic bowls because I was an Art minor in college, and I focused on pottery. They hug our smaller bowls perfectly, and the larger bowls are well insulated, too. I just use the corners of the cozy to carry the larger bowls if I need to. Thanks for the tutorial. That is a good idea. I have never made any of them before but they look like good gifts. Yay!!! I have been wanting to make some of these. I’ve never used a bowl cozy, but imagine they would be useful. Your tutorial makes it look simple so I’m thinking I’ll have to give it a try! 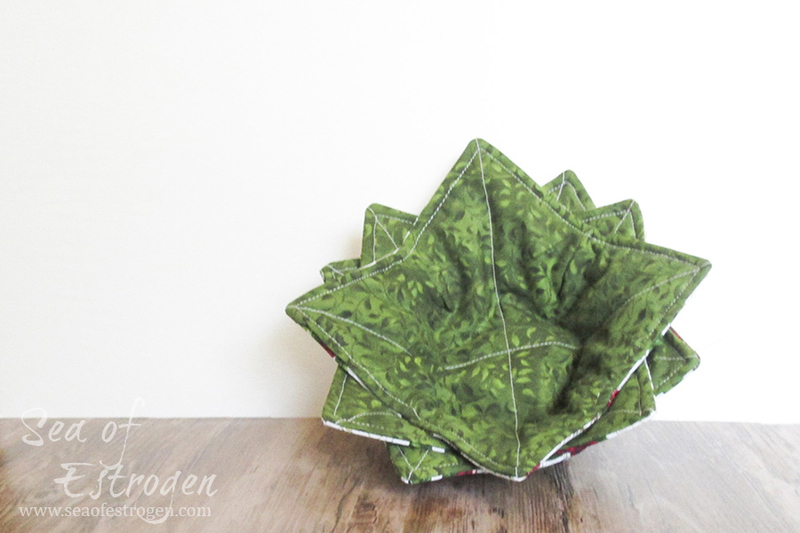 Thank you for participating in the blog hop and creating and sharing this great tutorial! I need to make some of these. They would be great gifts and I could use some of the scrap batting that seems to overtake my studio. Thanks for sharing. I did 12 days of Christmas last year and was looking forward to this year. I will make the bowls. Thanks. I like the idea of a bowl insulator but I can’t read your instructions since pop-up ads keep popping up on your blog. No one else’s blog I’ve been to seem to have this problem. Help! I love using my microwave bowls. They make such nice gifts. OMG! This is the first time that I have been to your blog and your name isSO funny! Thanks for the tutorial. I have made these for others but I do not have even one. I will use some of my amazingly huge stash and make some for myself. I think that I will use the good stuff, not the scraps! Ha ha ha! Yes, we have three daughters, and before the oldest graduated and moved on, our house was a crazy nest of hormones! Thanks for a great tutorial. I love using my microwave bowls. 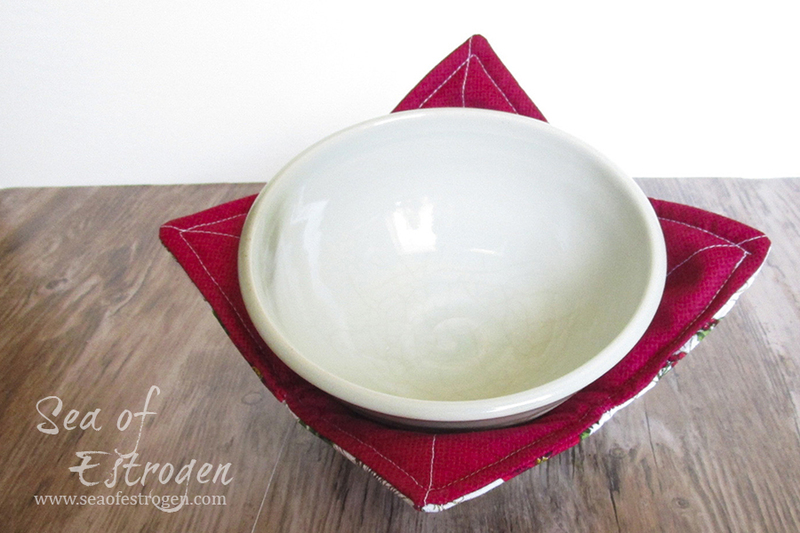 I love using the microwave bowl holder and need to make more. Your Christmas ones are so pretty. I didn’t think about making a dart template but that’s a good idea. Thanks for sharing. 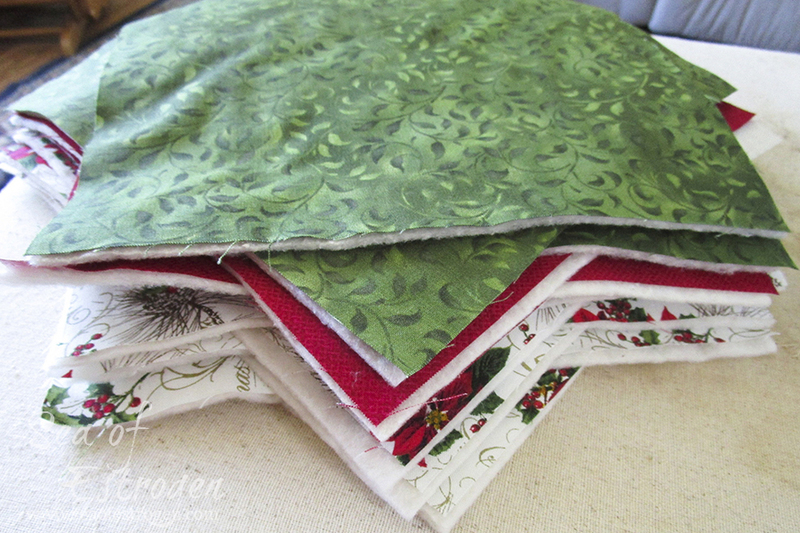 Beautiful fabrics…almost too pretty to risk spilling soup on!! Thanks for such a nice tut…I like the idea of making a template so that all the darts on all the bowls are exactly the same & you don’t have to measure each time. Good tip! Thanks for sharing a great tutorial. I am going to use this to make some for a co-worker — a great idea! We’ve made these – pattern a little different – with our quilt guild and sewing groups. Quick little craft to use up those scraps. Thank you for sharing. What a neat project – have not seen these before – they are definitely on my “to do” list! i made these for myself and love them. I have a stack of these set aside to hand out as people need / want them. What a cute gift idea. I have a friend who makes these and they are very nice. So many great projects on this hop. Thanks for the tutorial. I’ve always wanted to sew these bowls but for ice cream. Now I’m thinking great holder for chili bowl when football season is here. Fun, fun, fun! 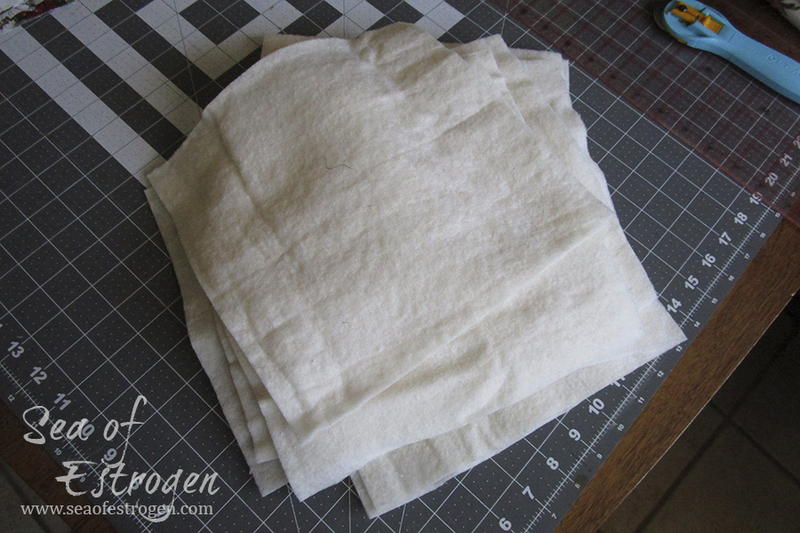 These are a great way to use up scraps of not only fabric, but batting as well. And, I can do it making gifts. This is a win/win deal! Thanks for the tutorial. I have some of these bowl holders and I use them a lot! Thanks! I love this idea! I have seen them before but have never made any, so thank you for the tutorial! Perfect timing, I was just thinking that these cozies would be great for our Quilt Show store and I needed the directions ! I was just thinking about how much I could use some of these. Thanks so much for this great tutorial! Do you think that it would be helpful to use some of the heat-safe batting, the kind I’m using right now to make hot pads? Or does the double layer of batting do the trick? Thanks again for this very timely tutorial. I think heat-safe batting would help, but you might still want to do two layers. I used 100% cotton batting because I didn’t have any of the pot-holder batting. Thanks for the simplified tutorial! This looks like a nice easy gifty project! just maybe the best idea for family x-mas presents!! I am gonna try make myself a few! Thank you for the tutorial, they look like perfect gifts for the ladies at work. Thanks for a great tutorial!! I just need to get some 100% cotton batting…I’m guessing 80/20 shouldn’t be used?? I wouldn’t risk using anything that wasn’t 100% cotton or made for pot-holders. I use my cozies all the time for microwaving. It would be fun to have some in a Christmas theme, too! Thanks for the tutorial. Great idea! Thanks for the great tutorial too. I’ve been meaning to make some of these, and your instructions are very clear. Thanks! Thanks so much for the tutorial. These would be great gifts! I made some of these for my daughter last year and just guessed at the darts. Thank you for such complete directions. We are soup lovers here and being able to warm up soup in bowl and carry to the table without burning hands is really great. I’ve made a few of these, but I got some helpful tips here! 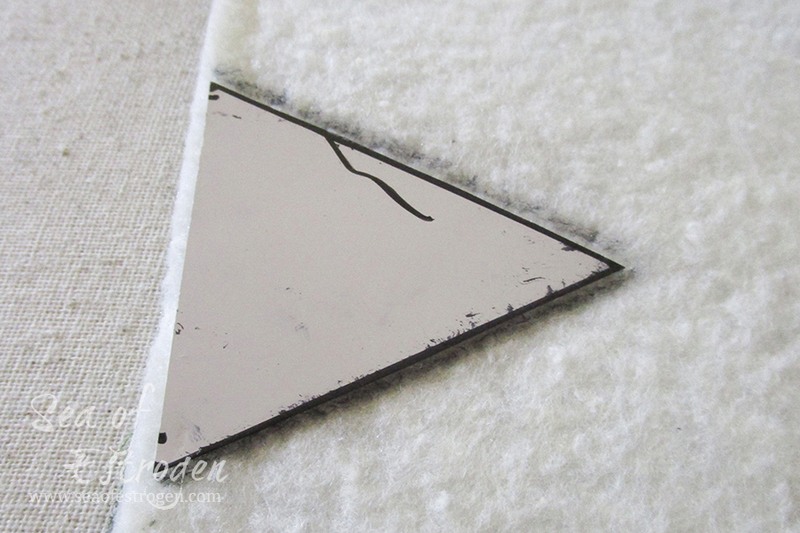 I will now be using a template, and I really like the idea of a print on one side and solid on the other! These turned out great and they look so simple to make – thanks for the tutorial! Thanks for the tutorial for these cute, but yet functional, gift ideas! Wow…a great tutorial! I hope to get some of these made, for sure! The perfect little gift idea! Making these has been on my list for awhile but it just made it’s way to the top! Great tutorial! I need to find some 10″ squares and make a couple of these right away! Great idea for Christmas gifts. Thanks for sharing. I don’t have a microwave as i only used it once a year on Christmas Day, however my children would love this, thats another gift to add to the every increasing pile i am going todo, thanks for the tutorial and blog hop! Thank you for such a cute project. Have a granddaughter getting married and these would make a cute part of a shower gift. I really like your tute for bowl cozies! It is so hard to get a regular pot holder under or around a bowl after it gets hot in the microwave. I will be making a batch of these this coming week, and what a great gift idea! Thank you. I made these for the millennials in our family for Christmas. They loved them! I use a dart that is about 1 1/4 inches wide for my Fiestaware bowls, since it fits them better. I have never tried a bowl cozy – it would go good with my fav lentil soup. Great directions! I’ve been wanting to make one or two of these. Great tutorial! I will have to make a few of these bowls. 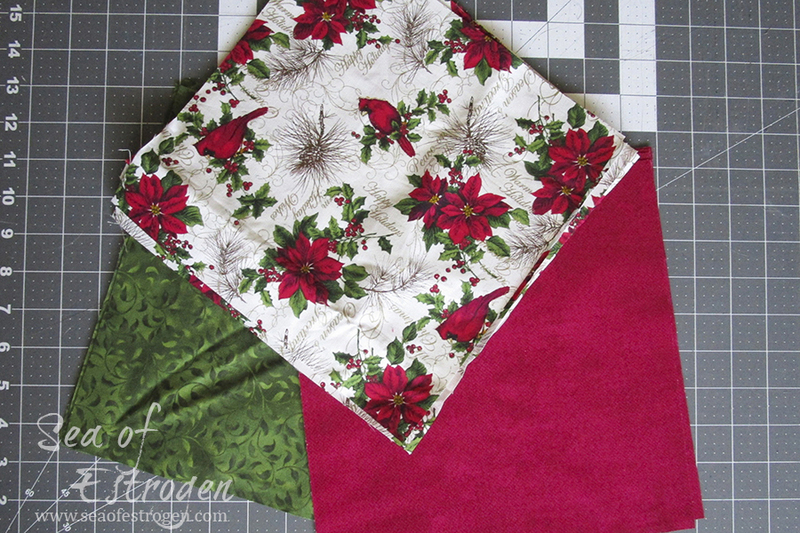 Thanks for participating in the 12 Days of Christmas in July Blog Hop and sharing that tutorial!! I’ve never quite understood how these were made, but your photos cleared up my questions. I’m glad to have clarified it for you! That you for a wonderful tutorial on these microwave bowl holders. I need to make a few……. Finally a tutorial for these that I can understand. BTW l love the name of your blog lol. I have not made these holders but have received one as a gift and it is great. I may be making a few more with your tutorial. Thanks! love your bowl — they would make a nice Christmas gift. Now that I think of it — they would be a nice wedding gift although a note would probably need to be included to explain what they are. Have you made bigger ones for bigger bowls? I have not made bigger ones yet, but I think larger ones would be great for keeping a pot-luck dish warm. They would also work well for passing a hot bowl of food around the dinner table at night! I love these bowls. I have a couple and could really use some more. This is probably the easiest bowl cozy pattern that I’ve ever seen! Thanks for sharing! I won one of these microwave bowls at my quilt guild and need to learn how to make them so I can stop sharing my bowl. I think a few people will be getting these for Christmas. Thanks. So excited to try making this one (pinned it!). I’ve been thinking of trying some of these for some time now. Would be the perfect gift for my mom =) Thanks for sharing! I can’t wait to see the pictures of the baby shower cozies, I bet they are adorable! Such a useful project, I’ll definitely try this out! Thanks for the tutorial. What a great idea for using up small cuts of fabric! Cute gift idea. Thanks for the tutorial. I bought 2 of these, at a garage sale this weekend, but, they are still on my list to make. Great tutorial. Those are the cutest bowl cozies! Thanks for the tutorial. Great directions – thanks for sharing. I’ve pinned to remember to make when it’s not so hot!! The name of your blog is so much fun! Cute project! Fast and easy hostess gifts! Thank you for the tutorial. 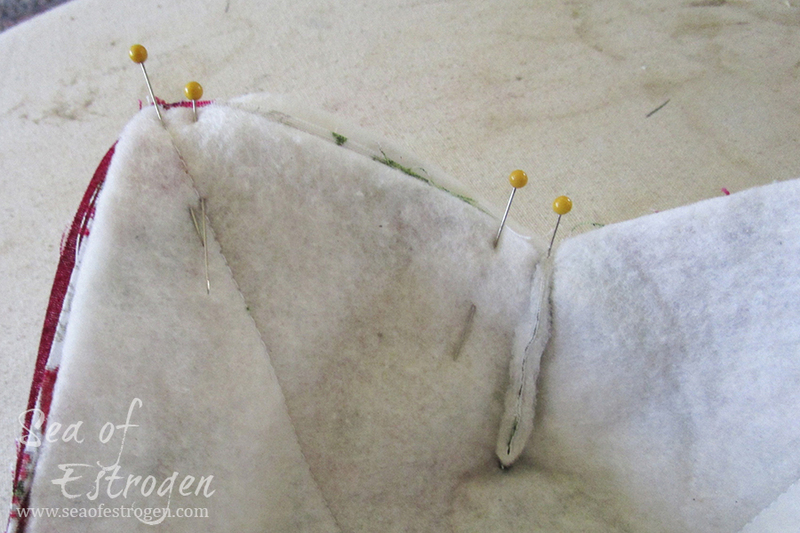 I am a beginner and I am wondering if you have any tips for sewing through two layers of cotton and batting–especially over the seams from the darts? I have two suggestions. The first is to change to a brand new needle just before you start topstitching. The second is to go slow, and when you feel like you’re moving at a snail’s pace, slow down even more. 🙂 I went so slow over the seams it felt like I was hardly moving, but it worked. Oh, bonus hint – if you have a walking foot, use it! Mine rarely comes off my machine anymore. Making these have been on my list for a couple of years. I must make some soon. Great tutorial, I have got to make some of these! Thanks for this tutorial. I have been wanting to make some bowl cozies. Such a great gift idea, Amy! And looks like a great way to use up some leftover layer cake pieces I have hanging around, too. Thanks for a great tutorial!! Thanks for the bowl tutorial Fabulous photos to follow. How pretty your bowl holders look, thanks for the tutorial. I have a question about the dart. When you say the distance to the center is 2 1/4″, is that the side of the triangle or the height of the triangle? I’m assuming the base of the triangle (flat part) is 2″. 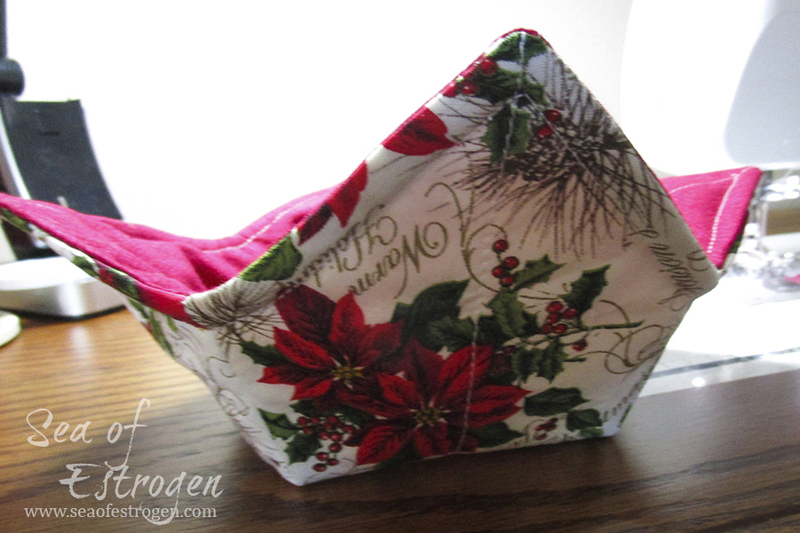 This is a great tutorial and will make great gifts anytime. Thanks for a great idea that can be completed in this lifetime. I tend to pick projects that go on forever. The 2-1/4″ is from the edge of the fabric to the point of the dart. I’m glad you find the tutorial useful! I was also going to say I like the name of your blog. I started taking estrogen when I had a hysterectomy when I was 28 years old. I was diagnosed with stage 2+ breast cancer many years later. The day I was diagnosed was the last day I was to have any hormones of any kind. My cancer was progesterone seeking and that didn’t matter. No more estrogen either. I have a friend who used to be a nurse that had a hysterectomy probably in her late thirties and started taking estrogen. Her mother was diagnosed with cancer in her 80’s and I told my friend she needs to think about stopping estrogen. As I’m finding out, my nurses think they know all about medicine and think they are not vulnerable at all and she thinks if she lives long enough she’ll have breast cancer anyhow. Breast cancer was not a cakewalk and I wish that I had known the possibility of using estrogen long term. I do not know if that was the cause or not. I do know that there was no history in my family. The good news is that I am in remission and I raised the flag to her. That’s all I could do. Again, thanks for a great project. I, too, had a hysterectomy at a young age (31), but I have never taken any HRT. My mom just passed her 5-year mark from having breast cancer. It was not the genetic mutation; however, I still get checked regularly because we didn’t have a family history, either. I chose the name for my blog because, at the time, I was a single mom to three girls. Our house was a raging sea of hormones! 😀 Even now, with the oldest graduated and on her own, poor Todd has to deal with way more emotions than he ever thought possible. These would make great Christmas or wedding gifts! Thank you. I made these a few years ago. I don’t remember that the tutorial I used was as clear as yours. Thanks, I’m sure I’ll whip up a few for this holiday season. What a great tutorial. I may have to make some. Thank you Amy. What a great idea. They also look cute all stacked. Thanks for the tutorial! I was given one of these a couple of years ago and love it! A friend of mine has a set of bowl cozies she bought at a craft fair. She says her family uses them all the time! I think I need a set too! Thanks for the tutorial so I can make some for myself and then gifts too! I need to make some of these bowls. Thanks for sharing. I have got to make some of these!!! Thanks. Thank you for a fantastic tutorial on the bowl cozies. What a great use of scraps for a daily need! Thank you also for the blog hop. I look forward to following you! What a clever idea-great for gifts and holiday craft fairs! Thanks for sharing. Hello from Canada, your tutorial was great and looks easier than the pattern I used previously. I love how your bowls turned out. Thanks for the tutorial. I marked it. Thank you for the well written tutorial! Your tutorial was much easier to understand than others I have looked at. Thank you for taking the time to create it. These are so pretty. I can’t wait to sew some of them for my friends. I never thought about making a template – great idea!! Thank you for sharing the very easy to follow tutorial. I like the idea of using a template to mark the darts. Love the bowls! Great tutorial. Someday I’ll get around to making some of these bowls. A quilting friend has made these to sell and they are one of her top selling items. Thanks for the detailed directions. Great gift ideas! I will be bookmarking this post! 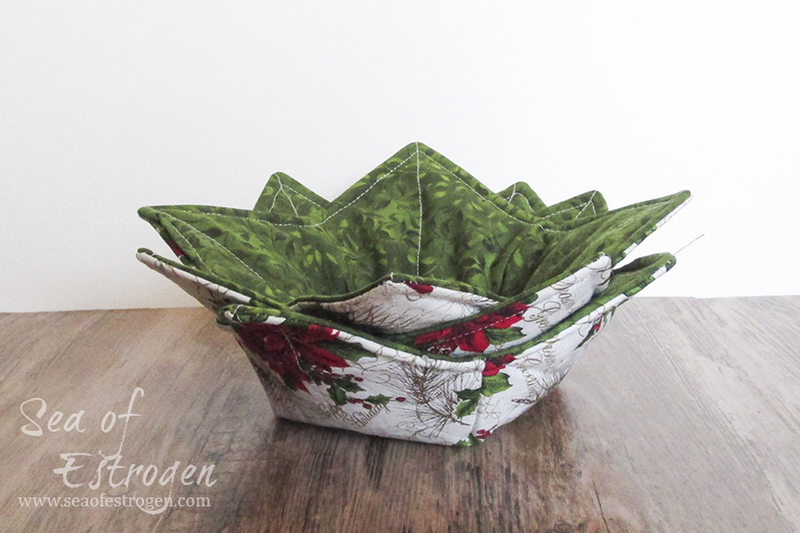 I received a couple of bowl cozies for Christmas last year and love them. I really like the fabrics you used in yours. These make the nicest gifts and are fairly quick to put together! These are great, I have been wanting to make some. Thanks for the tutorial. Clever girl! These look like they would make wonderful gifts. I really need to make some of these bowl cozies. Thanks for the tutorial. Those bowls are so pretty. Great project…I need some of these…thanx for the tute! I haven’t tried these before but now I think I need to. 🙂 thanks for the great tutorial. These would make excellent Christmas gifts! Thank you for the tutorial. THANKS FOR SHARING THIS BEAUTIFUL COLLECTION! Your instructions for the bowls were very easy to follow. Thanks! Click…and SAVE! SUPER creative and easy, thanks for the tutorial. I have made a couple of these bowls for others…but need to work on more. Thanks for the reminder and good tutorial. Fun tutorial. I have such odd size soup bowls I’d need to try one to see if it would actually work. Thanks for sharing. We have bowls that range from very small (7″ lip to lip around the bottom) to very large (14″), and this size has worked well for all of them. You could always increase or decrease the size of the squares based on your bowls. These are wonderful! I’ve seen them before, but never inquired on how to make them and you make it sound so simple in your tutorial. I am definitely going to give these a try for gifts this year. Thank you. Thanks for the great pattern. I can’t wait to make some. I see lovely little gifts for friends and family with your tutorial. thank you for sharing. Such a great idea as a gift. Thanks for the tutorial. Clever! And pretty. What a good idea. These really do make great gifts! I need to make some of these! I need to make some of these. Thanks for the tutorial. Thanks for sharing. These are fun to make and to use. I love these and have made a few but have given them all away. I need to make some for myself! Brilliant tutorial. Thank you for the idea. Very clever idea, and a brilliant gift idea! What a great tutorial! I love this idea. And a great way to use those leftover layer cake pieces too! A fantastic gift. I definitely have to make some of these bowl cozies! Love them made in Christmas fabric. Thanks for the instructions on the bowl cozy! I’ve been wanting to make them but hadn’t hunted for instructions yet. 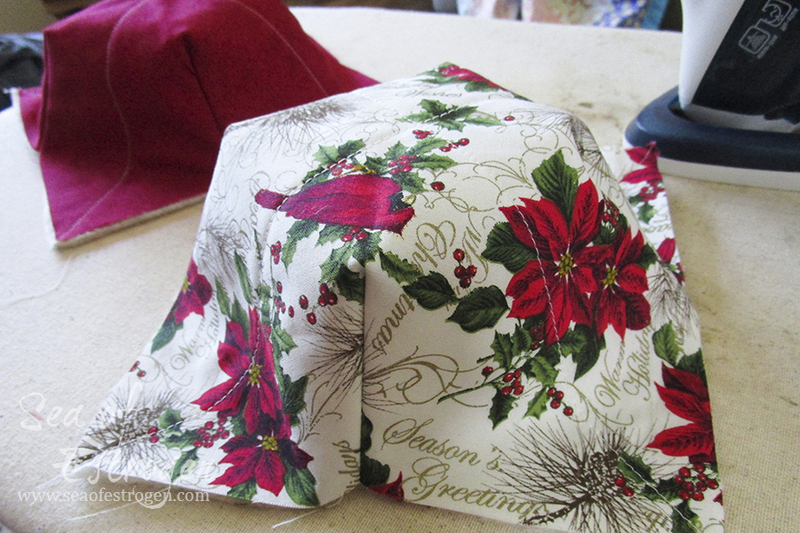 What a great, quick gift (my favorite kind of holiday sewing since the holidays are so hectic!). Thanks for sharing! This is an awesome idea, simple and easy to make for last minute gifts. Thank you for sharing! 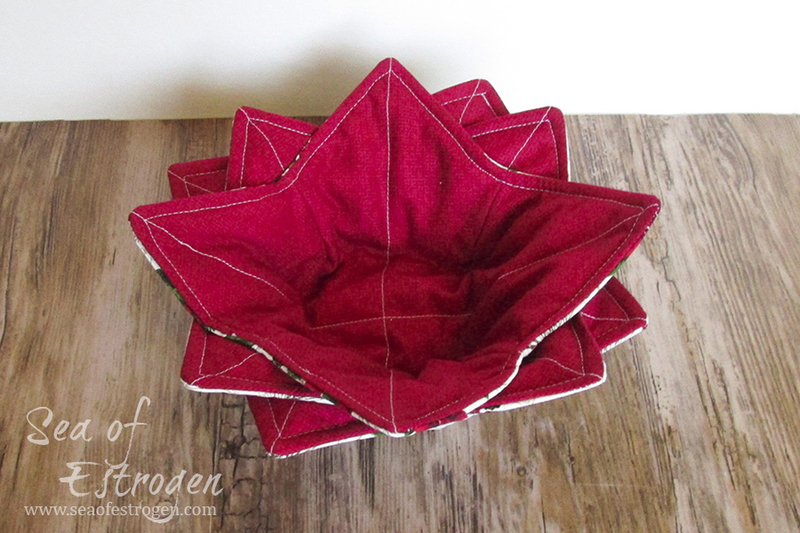 I love my bowl cozies–even my hubby uses them! I’ve been wanting to make some of these and your directions are very clear! Thanks! your bowls are so pretty. i made some of these bowls a few years ago and had so much fun. they are so addictive. i made fabrics that fit each person and had a ball. thanks for sharing. Made 3 bowl cozys! Thanks. I love the microwave bowl cozies. I used mine all the time and need to make more. Yours are very cute in the holiday fabric. Thanks for sharing. Bowl cozies are amazing. Great Christmas gift idea. These are so pretty and your directions were very easy to understand. Thank you so much. What cute bowl cozies. Thank you for the tutorial. Great tutorial! I really need to try making some of these.